Finally, I’m posting my Charizard pattern, haha. I’m sorry for the very long delay! I was very busy this months and crocheting wasn’t my priority (>_<“) But, now, I got some time to crochet and was able to finish this so desired pattern（‐＾▽＾‐). This time, I decided to do a Shiny Charizard, because I don’t like very much to do same thing many times, so, at least, I changed his color, lol (＞▽＜). However, you don’t need to do his shiny too, you can make him in his usual color. 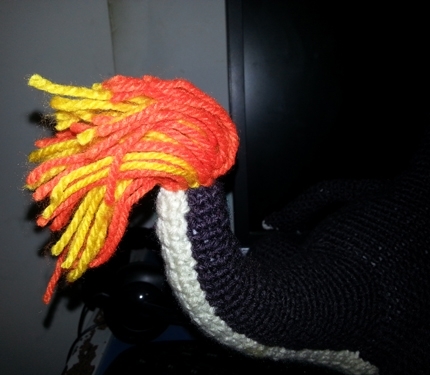 Moreover, I improved his pattern, changing some things that I didn’t like very much. – Please be extremely careful while handling the wire, it may hurt you if you don’t handle it properly. Now, we are going to work in rows. 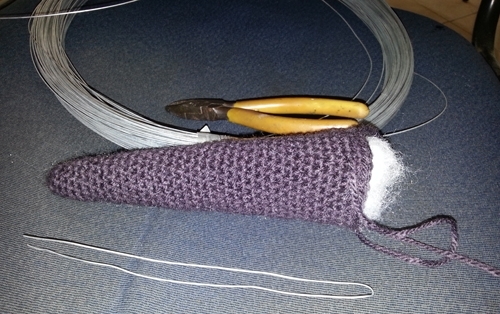 Finish off and leave a long tail to sew the head. Border: ch 1, sc around the edge to make the border. Finish off. 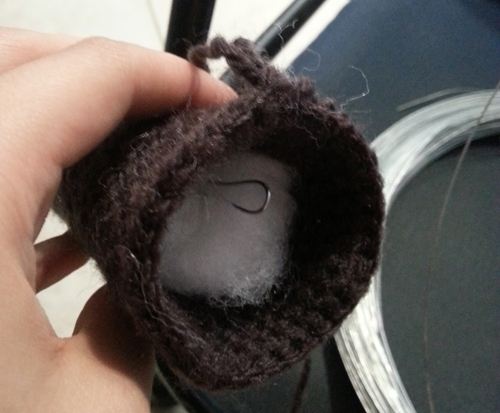 ** Start using white yarn and 2.5mm hook. **Change to lead or orange yarn. Ch 1 and sc around the edge. Finish off and leave a long tail for sewing. ** We are going to make 2 wings in lead or orange and 2 in red or teal. 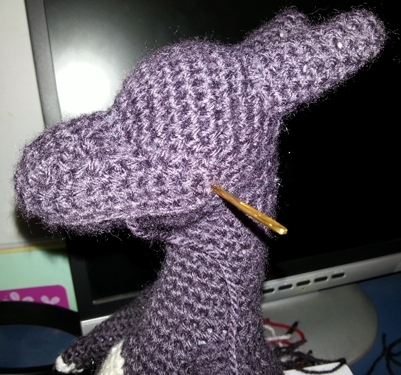 Well, when I was making this pattern and until today, I was very indecisive about his snout size. However, I figure out that the two sizes I was thinking about are good, it is just a matter of style. So, I will post the two versions here and let you decide which one you like. One is shorter than the other. In the photos I used the shorter snout, but I also like the other one. The difference between them is one row. In the longer one, you are going to crochet one more row of single crochet before starting the Round: sc 9, inc, sc 8 (19). The video tutorial teaches how to do the longer version, but it also works to the shorter version. Just remember to reduce one round of single crochet. The first step of the snout will vary depending on the option of head you choose. If you choose option 1 (head with shorther snout), you will make the option 1 of snout, which has 27 ch. If you choose option 2 (head with longer snout), you will make the option 2 of snout, which has 31 ch. Now, lets work in the center and in rows. sl st (sl st always along the side of the snout). Row 2-5: turn, skip the 2 sl st, 6 hdc, skip one stitch and sl st in next 2 stitches. V. Finally, stick the end of the wire in his head end sew it to his body. V. Sew the tail to his body. 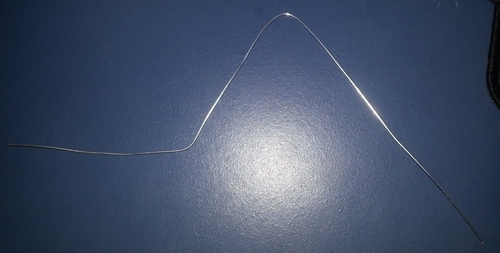 In this photo the wire is not bended. Please, remember to bend to make it double. This is necessary to give more support to the wings. Here it is the long double wire. It needs to be long enought to penetrate Charizard’s body and reach his legs. V. Now, use the contact glue to glue the red and lead parts together. IV. After that, it is time to put the two wings in the body. First, stick the long double wire near his neck in the middle of his back until it reaches his legs in the same way as the photos bellow. This is necessary to give support to his wings. V. Then, sew the wings to his body. IV. Now, sew the nostrils in his snout. IV. Brush the yarn and it is finished. 15. The last thing to do is his teeths. Use white felt to make them. 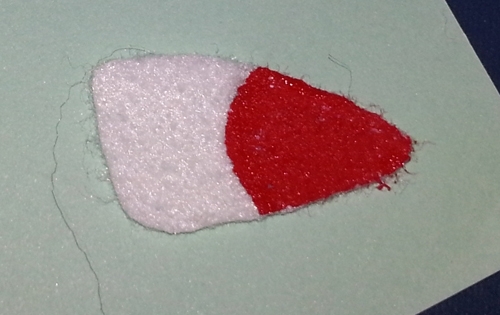 Cut the felt and glue inside his snout, leaving the tooth tip visible. I did not created this character, Charizard is copyright of Nintendo!! How do you attach the snout? I’m pretty sure I messed up on it but maybe I’m just looking at it wrong? I think using “wireless” is dangerous for children. What do you think? Hello, can someone please help me? I’ve made the wings some weeks ago and I’m sure there were no two pieces and no hdc in this pattern… I haven’t got enough orange to make those new wings again and need the old pattern for the second colour..
That doesn’t answer my question. Thank you so much for such an fabulous pattern! I am in awe of you and your ability! You are my hero. I’m making a zubat for someone and your wing pattern really helped me out! I’ll be sure to link back to your full pattern when I can share the photos. Your wings are awesome! Thank you so much for sharing your pattern. Tiene paso a paso charmaleon?? ? 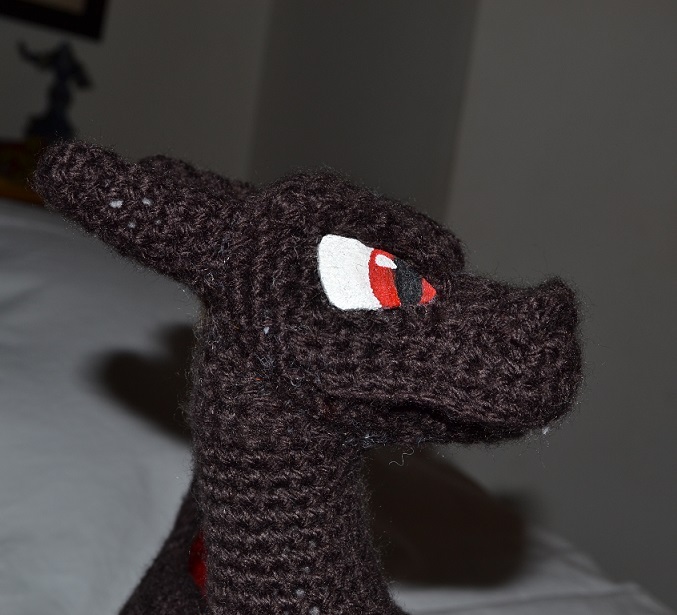 Hi… i am making this charizard while im working away in the mines for my older brother… thank you for the pattern, it is the best one that looks like the actual pokemon. I was wondering. When do you stuff his legs??? 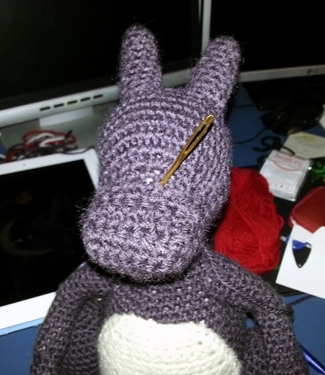 And i am finding it hard to do his eyebrows since its only a few stitches. How do you combat this? hi ! sorry i speak spanish !!! You could specify what each abbreviation means, please !!!!! Thank you for the pattern, very lookig forward to try it out! May I ask how many skeins would be needed please? Thanks and keep up the awesone work! Hello first THANK YOU I’m obsessed with Dragons though I haven’t started this one yet. My question is What is the difference between the two patterns of Charizard and Mega Charizard-Y? How tall are they? Again thank you for being so generous. hello. im confused on the arms, row 5. sc 3, dec in next 2 sc (8). is it sc 3, do a decrease then sc 3 and dec again. or do 3 sc, decrease then decrease again and contine to sc until the end of that row? Thank you so ,uch for this pattern, it’s really Awesome!!! I am making Charizard for my 11 yr old son. (He is coming out perfect). I just wanted to tell you you are a Goddess for posting this pattern!👑 (And for your page) 💜Thank you so much! He is over the moon about me making this for him! Thank you for the free pattern! I love it!….. Please can you or somebody else help me? The wings is made in hdc …… do I increase in hdc to? I made Charizard last month for my nephew and yes, I increased in hdc too. So 1 increase is 2hdc in 1 stitch (if the rest of the row, or the previous stitch, is hdc too). (My nephew loved the present btw, so major thank you for the pattern! 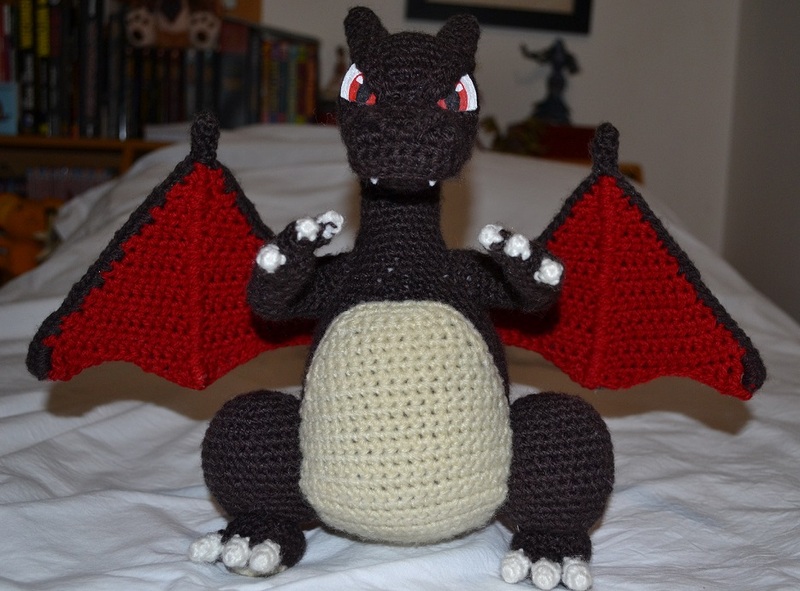 I’m starting de charizard as a birthday present for my nephew, and I have a doubt with the body, on round 40 you start to crochet in rounds, so my doubt is if you turn in all remaining rounds? The neck is like a staris in de border?. Hello, I am doing this charizard and have the same question that your. Since you solved it? How long did it take you to make one? What size yarn did you use, and how many skeins per color? I am working on this now. I used an entire skein of Red Heart Super Saver (Worsted Weight) Approximately 330 yards for the main color. The underbelly and contrasting wing color was only a small amount of each color and a tiny amount of white for his nails/claws. It didn’t take but a few hours to make all the parts. The assembly is taking me quite a bit of time. May I ask you what size wire ? I mean like what’s it called ? Where can I find it? How much will I need ? Please help and Thank you in advance. Hi Michelle, I don’t know if you ever got an answer or perhaps the project has been completed by now ( just saw this question). I can’t remember the gauge of the wire I used, I do know I got it from Menards in the hardware dept by all the wire (only comes in one size roll & I didn’t even use half). The craft/jewelry wire from the craft store that I tried was too flimsy. Hope this helps! What guage wire do you use in this project??? Its beautiful! Mia, I love the Charizard Dragon. I am working on mine. Hope to get it made soon. Thanks for the pattern. Hello Mia, do not understand how the wings attach with wire, in step 4, could you help me please? Chain 2, treble crochet, double crochet, half double crochet, single crochet, slip stitch 4, single crochet, half double crochet, double crochet, treble crochet, double treble crochet. Do those all in order. There should be 13 stitches when you are done with that row. Love making this!!! Thank you!! I’m having trouble with the snout that covers the snout lol. It’s not long enough to cover but it only says to go to round 5 but it doesn’t even come halfway up his head/snout. What am I doing wrong? hey and thanks fore the pattern i hope you can help me. I am at piece number 1 of wings and at row 14 it says: ch2, trc, dc, hdc, sc, sl st 4, sc, hdc, dc, trc, dtrc (13). What does all of this mean help i am lost in tranclation. 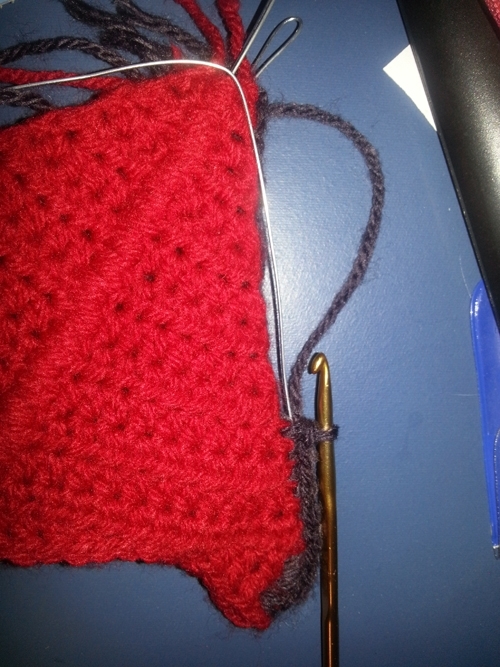 Chain 2 stitches, then treble crochet, then double crochet, then half double crochet, then single crochet. Then slip stitch 4 stitches, single crochet, then half double crochet, then double crochet, then treble crochet and finally a double treble crochet. Hope that helps! ? Chain 2. Triple(or treble)crochet. Double crochet. Half double c ocher. Single crochet. Slip slitch x4. Single crochet. Half double crochet. Double crochet. Triple (treble) crochet. Double triple crochet. These are to “us” terms. You can easily find converters online if you use UK or AUS (or some other) terms and all of these stitches can be found on YouTube. I have to look up how to do the double triple crochet to do this because I had never seen it before. chain 2, triple crochet, double crochet, half double crochet, single crochet, slip stitch 4, single crochet, half double crochet, double crochet, triple crochet, double-triple crochet. The triple crochet is the same as double only you yarn over an extra time before going into the stitch. Double-triple crochet is another yarn over(so two yarn overs more than a double before going into the stitch). There are guides online that show you how to do these ones and probably explain it better than I can. Hope it helps! Olá, será que eu consigo comprar com alguém? Hello!! Thank you so much for the pattern!! I just finished mine and it looks great!!!! I’ll be waiting for the Mega Charizard X.
Hello everybody again… I’m almost through with the separate pieces, but I’m stuck on the horns. They don’t look right, because when I increase from 6 to 8 sts per round, it makes an odd bulge. It looks like a teat! Any suggestion on how to fix that? Btw, I’m working with a double thread. Thanks in advance for your help. I would like to know which brand of yarn you use. Is it natural wool ou sintetic? Thank you very much! Hi Andreia, in this pattern I used synthetic. Wonderful work! :) Charizard looks perfect! It’s a while since I have used someone elses pattern (usually I make mine myself), so it’s quite a task! I was wondering – the arms, how have you made them bend? Did you apply wire on the inside? Do you stuff the feet lightly or just sew them on as flat “plates” and attach toes? Which kind of wire have you used? The elephant wire is too thick, so I got some thinner wire but it’s very “soft”? Thank you! I put wire inside his arms. I do stuff his feet lightly. 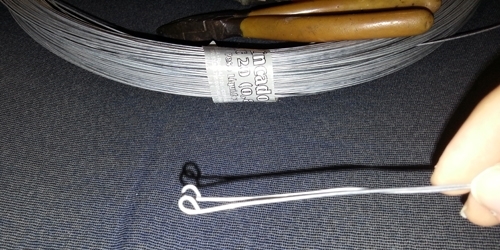 I use a malleable galvanized wire, it isn’t very thick. How do you know which hook to start with? I think its all 4mm unless it specifically says 2.5mm hook.. I don’t know whether there still is someone able to help me with this pattern, but I’ll try. I think there are various mistakes here and there – e.g. 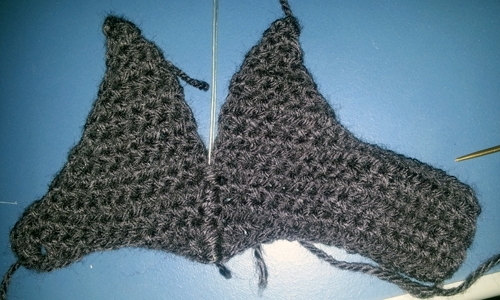 I’m working on the 2nd piece of the wings but the row with 10 ch just doesn’t seem right. Could it be 10 hdc, maybe? I assume you mean row 8? the 10 make sense, you basically make a chain to make the piece longer and to start to form the base of the longer bit which is going to be close to the back. I got a bit confused at this part as well but just follow the instructions and it will end up making sense. Hi Mia, thank you so much for the pattern. It was a pleasure to follow – even though it turned out to be hard work! I managed to finish an orange Charizard, that my nephew got for christmas, and it actually became quite nice. So thank you – I can’t wait to try out some of your other patterns. I am wanting to do this pattern and as I was reading through it I got confused on hoe to begin the head pattern for either option one or two. Can anyone help me? Hello I have doubt in the row 14 of the wings do not understand that it is pd 4, the point dtrc and cc, which happens that I am Chilean and it has been difficult to me to extract very much points of the charizards please help me. If the inconvenience is not great. Please help me. I want to make this for my grandson. I am having trouble getting the body started. For instance, what is “mr” in the 1st round. Im pretty sure its stands for magic ring. You can find out how to do that on you tube. Hope this helps. Hi Mia!! I love this pattern but I have a problem. 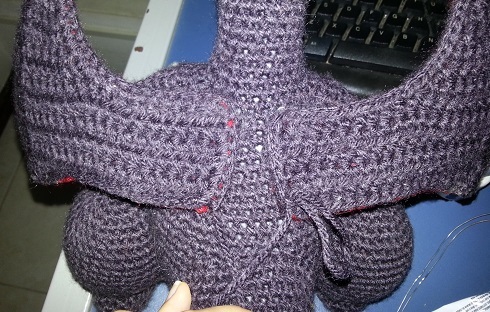 I don’t understand how to make the wings, the crocheting part I get it, but I have no idea how to add the wire and with those pictures in the pattern I just can’t get it. Can you (or anyone) help me? Please! The way i did it was to bend the wire into the shape of the wing and tack it down with a piece of yarn and tie the knot in the inside of the wing. Its not the easiest way of doing it but thats what worked for me. P.P.S. Is your charizard done with the longer snout? I can’t wait to make this for my brother! Heyo! I was wanting to asking something for a little while. Will 3 balls (each 100g) be enough yarn for Charizard and MAYBE mega charizard? Also Will charizard still look good if I use a lightish blue or dark green for his wings? This is my first amigurumi pattern i’m doing. I am making this for my boyfriend as a gift. :D I need some help though. I’m still on the body and I’m up to the neck part. I’m confused about if there is supposed to be a gap there or not. Could you or anyone else please simplify rows 40-45 for me? I’m stuck at the part of the wings! I don’t understand this number Thing. You say that I have to do Piece number 1, 4 times and Piece number 2, 4 times, but in the ende there are then 8 wings? Or didn’t I understand it correctly? Could we Chose between Piece number 1 & 2? 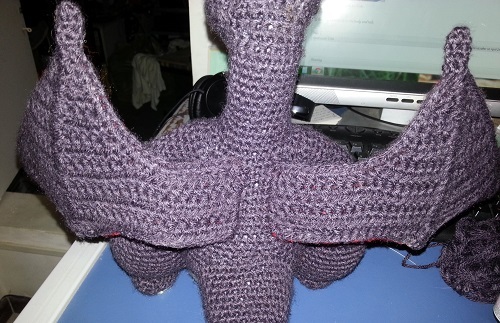 But exellent work so far and thanks for Patterns, your Charizard Looks amazing! I was wondering if plastic canvas would work inserted into the wings instead of using wire. 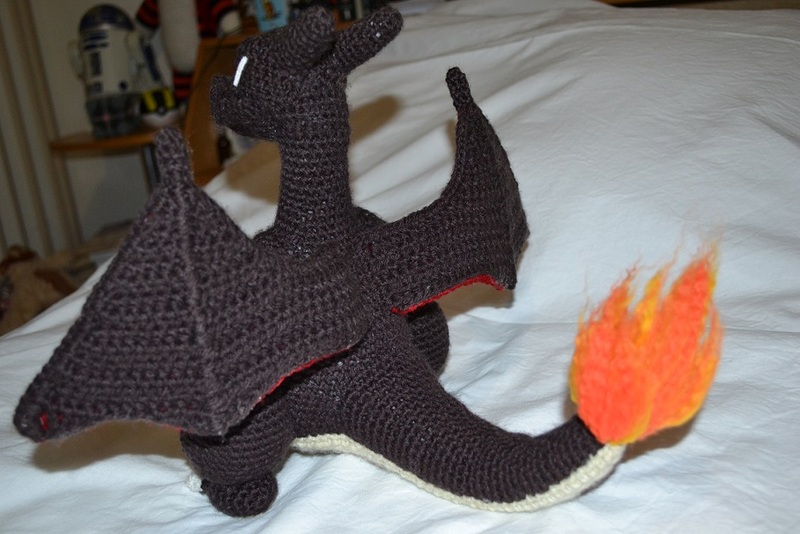 When I made the Charizard the first time, I found the wires poking and scratching me. Estoy enormemente agradecida por tus patrones de amigurumis. Salen sensacionales. Gracias, Gracias y Gracias!!! Sos Genial. Hola Mariana .. al ver que hablas Español me emocione ;U; ….tengo una duda con las alas me podrías ayudar por favor? thank you for the free pattern i love it!!!! could you make a toothless to? Have you made this jenny. I’m stuck on tail row 3. I can never make 11. I’m confused please can you help me. Your the most recent post so I thought I might get reply. Thankyou for any info. I am having a lot of trouble with the wings. I am not entirely sure how to sew the two parts together is it just just slip stitching them together with the wire in between, or what? Please reply as fast as you can, I need to have this finished by Monday for my sister’s birthday. Wow this took a lot of work. It is very kind of you to make this available to everyone. I was sent a link to this pattern by a friend requesting me to make one now. I think I will attempt it. Thank you so much for making your pattern free and printer friendly. Thank you sssoooooo much for the pattern, I made it for mi son that will be 5 this weekend and I hope he will like it so much as me. It was very hardware to do, especialy for the wings ( Well, all the part with the wires), but I feel proud to complete it! I want to put a foto of it in this comment but it seems that it’s not posible… I will post one on my Facebook page if you want to see it. Amazing tutorial. I appreciate this greatly. Thanks for providing this free! thanks for this pattern. I’m so happy to do it. Can someone please tell me what kind of wire I should use for this pattern? The wire I got is not at all easy to work with. 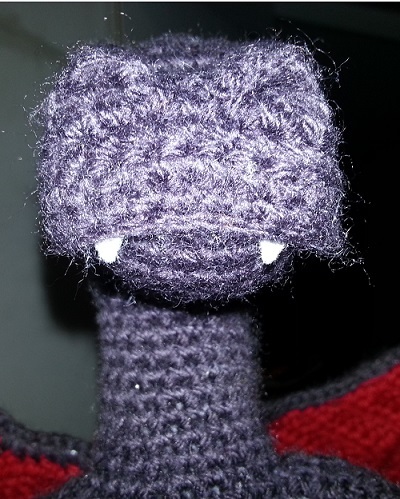 I’m making a Crobat for my boyfriend and I’m trying to use your pattern for the wings rather than the one I already have, but I’m still pretty new to crochet and this is the first project where I’ve dealt with a half double crochet. 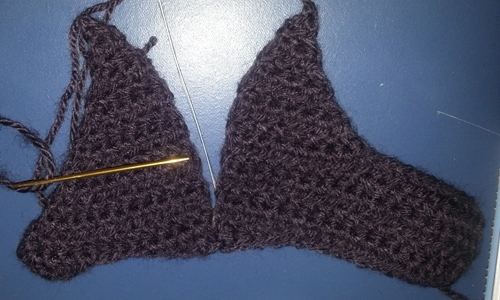 I’m able to accomplish wing piece #1 row 1, but after chaining 1 and turning the piece my brain can’t seem to figure out where the next stitch should go. I was also wondering how you “increase” the row. Is it another hdc or a 2sc? And where would this stitch go? I forgot to say in the Tail section haha oops!! Omg this charizard is soooo perfect ! Thank you so much for the pattern ! Thank You for this Pattern. I Love Fire pokemon and Charizard was always my first favorite. Here is the one I did from using your pattern! I would like to have this pattern. How do I print it out? My grandson would like to have it for Christmas. 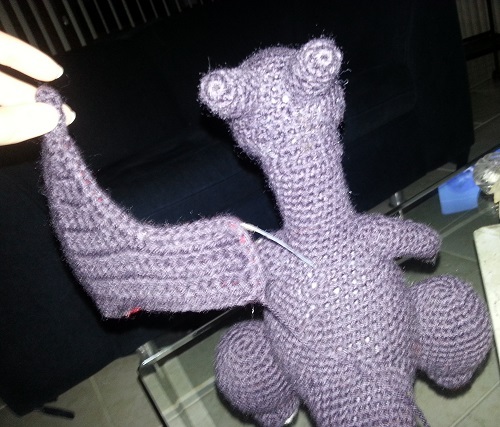 Could someone give me the length of the body and the tail and the over all height of the finished Dragon? I am using a different softer yarn so I have had to adapt the pattern, but I want to make sure I have the dimensional proportions correct. Best charizard pattern online ever! So epic! My brother likes charizard so when i get a new hook i will make him one. thanks for making it FREE! Hello! First, I love love love this pattern. I’m making one for my boyfriend. I was having a lot of fun, but I found a place that just has me stumped. I’ve been crocheting for two years. I’ve learned to count stitches religiously to make sure I’m going right. On Row 35 of the tail you say it should come out to 29 stitches. But when I count for Row 35: [(8 sc, sc in next sc), repeat twice, 7 sc, in] I only come up with 27.
the “(8 sc, sc in next sc), repeat twice” is 18; the “7 sc, in” is 9. 18+9=27. Did you mean “(8 sc, in), repeat twice”? Every row after that is the same way. I know people have said Row three is messed up, but I’ve counted the stitches in all the rows and all the rows add up fine till Row 35 on the tail. Maybe I’m not understanding seeing as I’m no where near professional, I just love the craft. I thought it was a little off. For some reason the pattern doesn’t say (8sc, 2sc in next sc). Honest mistake. Thanks a lot, friend! Keep Crafting! Wow what a challenge he was….but he is done Thanks for sharing all info. Hi Mia, first of all thanks for this pattern. I just have one question, how tall is it? Just to have an idea. I was wondering if anyone could help me with attaching the head to the body. I’m not sure i quite understand how to do so with the rows that are at the top of the neck. I have tried but failed many times. It is the only piece I need to sew on to complete everything. The Rows of his body should be attached to the back of his head. First, I would like to tell, you thank you for sharing your pattern here. It has been hard for me to do it, but finally I managed. I would like to send you a picture, but I don’t know how. I have doxne it in orange colour, which is the one that my friend’s son wanted for his birthday. She told me to do it for him, but unfortunatelly after all the effort and time she decided to give him another present… Yes, it has been very sad to hear this from her, but I trusted her and now I have Charizard at home. I wanted to ask you if you mind that I try to sell it on Etsy. I say try because I don’t believe I would manage, but in case you agree just tell me how to do it, what I should write to say I have used your pattern. You are welcome. Please send me a picture to my email ([email protected]). Omg, that’s sad, so much effort… >.<" Well, I don't mind if you sell it on etsy... I just always recommend not selling, because when you do so, you will be infringing nintendo's copyright. Mia. I’m having a lot of trouble with the head. it says ch 6 but I don’t have enough ch to work all the stitches this pattern is calling for. it also says ch the 6 but never says to join it but it says. if someone could please help this is the last piece I need to make but the math in the number of stitches just to start the head are not adding up, I’ve tried many different ways to get it to work but I can’t, and the video posted will not play. If not one else has replied to you, you have to work the stitches in both sides of the chain. So you ch 6, sc in second from hook, sc each in the next 3, place 2 sc in the last ch on one side the the third in the other side of the chain. Working on the other side of the chain, you sc in the next 3, and finally place 2sc in the last of the chain. You should have an oval now with little spaces in the middle. I hope this helps. In the underbelly section, from row 36 you dont’t say anymore “ch 1 and turn”, do I also have to do it? Yes, I forgot to write it, sorry. I absolutely love this pattern! 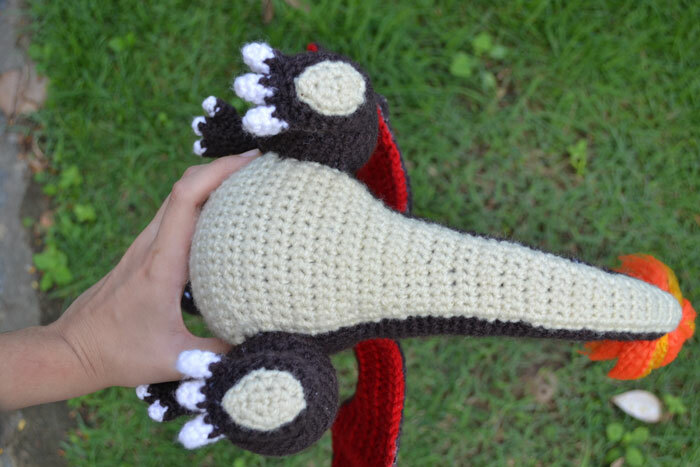 I need to make all the pokemon from crochet patterns on a dare. I’ve already got more than 100, and this one is perfect. Hi Mia :) first of all I would like to thank you for the free pattern, it is awesome! 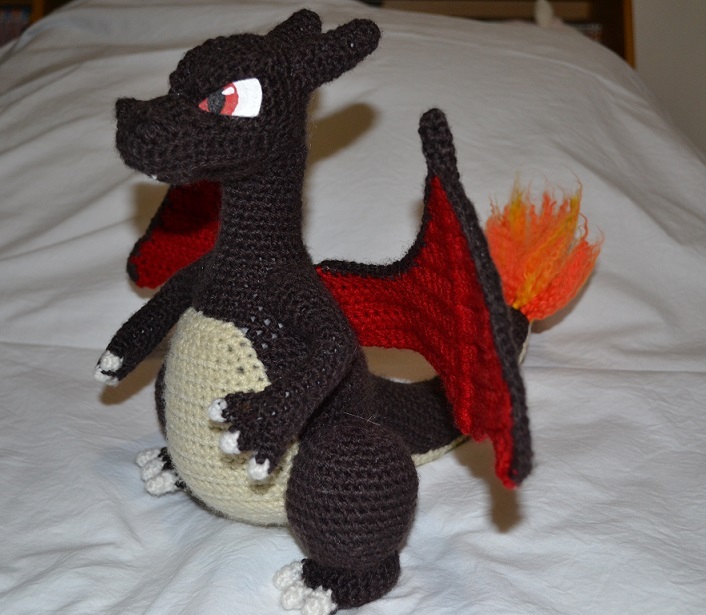 I would like to do this charizard for my son but can’t seem to find the yarn in color lead. May I ask where did you find it? I bought it in the downtown of my city (Maceió/AL, Brazil). However, since I made this Charizard, I’ve been searching for this color to make another Charizard and I just can’t find it anymore! Even on the internet I’m not finding it. So… I think that the best option is to use the color black. The next one I will do, I will use black yarn. Yeah! I do agree with you! A dark grey would look better. I thought about black, because most people say that he is black, but I don’t think so… I just can see a lead or dark grey. Well, I will try to find this yarn, but here in my city even the dark grey it’s being hard to find. That’s so annoying!! 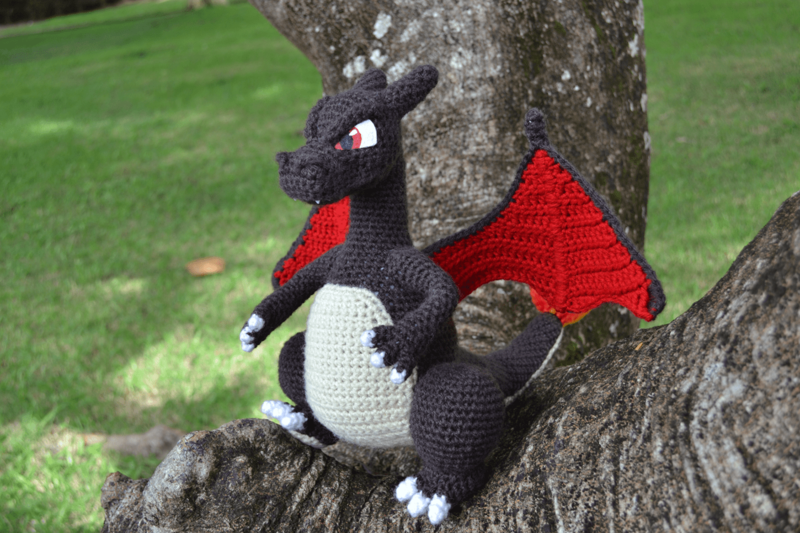 And I’m planning to do mega charizard X, so, I need this yarn!! If you find it on the internet, please let me know. Thanks for your help! First of all, I want to say I’m completely amazed by this pattern! 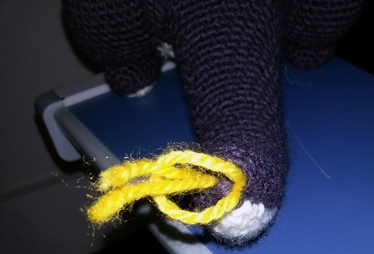 I’m at the snout, and I’m having issues understanding just how these stitches are supposed to be. Is there anyway you could explain a bit more about how this shapes up? Hi, I’ve made a video explaning how to do it and I’ve changed the pattern a bit. Is there sound with this tutorial? I’m having a little trouble understanding the body pattern. How do you decrease when you’re working in rows? Like how do you go from 18 sc in round 39 to 16 sc in round 40 and so on? You have to decrease 2 stitches in each row. So, in each row, decrease one stitch in the beginning, crochet some stitches in the middle and then decrease another stitch in the end of the row. For example, in Row 39: dec, sc 14, dec. In Row 40: dec, sc 12, dec.
You don’t have to do nothing different to change from rounds to rows. 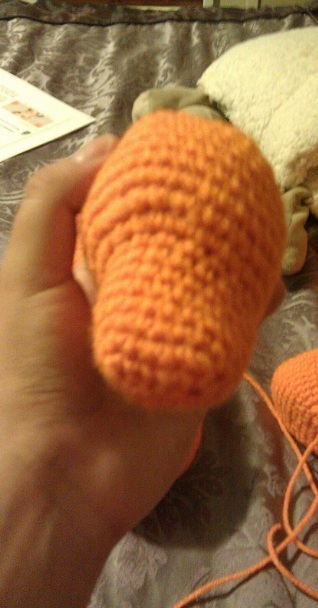 When you finish the last round of his body, just go on crocheting the first row in the next stitch. When you finish the first row, ch1 and turn to start the second one. That’s it. His body will look likes a broken bottle. i am almost done making the Charizard and i was wondering, there is an event coming up for cancer awareness in my area. there will be walking to raise money and a silent auction. would it be ok for me to donate the Charizard for the silent auction. please let me know. the event is on may 5th. thanks. Do I start with hook 4mm? Yes. Just use the 2.5mm when the pattern says to use it. First off, I want to say that this Charizard is the best thing I’ve ever seen. God, you even put his pattern here for anyone to use, while you can see so many mediocre patterns for sale around! What are you, an angel or something?! That said, I’ve got a little problem. Well, it’s more like I’m a bit confused. and, from what I understand, this means two Piece number 1 and two Piece number 2. But then you wrote the same thing about each piece, so… is that actually 8 parts in total? Well, I guess I’ll understand it anyway, once I’ll have all the pieces to put together but, unless I’m the slowest person around here (and I might as well be) this could be confusing for other people too. Anyway, thanks again for this wonderful (and free!) pattern. Hi, I finished the dragon and it did end up being, 8 parts in total. There are four wings, two red for the front and two lead for the back, but there are two panels of the wing that you sew up together first. You can see the ridge in the sewing pictures that shows how it’s lined up :) And I agree, this pattern is just amazing! My name is paola, I love your pattern!, however I don’t understand the 2nd part of the snout, please could you help me??? Hi Mia, thanks for this wonderful pattern! I’m making it for my son. just a question, the arms are finished in “open” rows? (I mean, not round rows). If so, how do you sew the fingers? Hi Claudia, you are welcome! The end of his arm it is the shoulder of Charizard, it is the part you will sew to the body. So, you will sew his fingers to the first rounds of his arm. Hi! First of all : thank you so much for this pattern ! It’s extremely well written and detailed, so it was a real pleasure to make this little dragon ! Here is my version ( a grey and blue one) if you want to have a look ! Hello Mia :) sorry to disturb again :/ but im having problems with the wings.. i don’t get the first row itself “chain 2 hdc 1” i don’t know how to do it. I’m an amateur and i don’t know how to do all the stiches correctly.. help me out please..
You are going to make 2 chains and then make a half double crochet (hdc) from the second chain from hook. Hi Karishma, do you still need any help with the snout? thank you very much Mia ;) no that’s ok .. really love ur pattern almost finished with my charizard :) again thank you very much ..
Olá Mia, só queria agradecer por fornecer o passo a passo deste LINDO dragão!!! Ainda estou a aprender crochet e ainda não estou preparada para fazer já este tipo de trabalho mas espero chegar lá! Obrigada por se dar ao trabalho de partilhar estas coisas lindas!!! Olá, Paula!! Muito obrigada!! Fico muito feliz em saber que você gostou dos meus trabalhos! O começo é assim mesmo, a gente ainda não tem o ponto muito firme, mas aos pouquinhos você vai melhorar e fazer coisas lindas! ^_^ Uma dica é sempre praticar! Um abraço, Mia. Muchas gracias por el patrón..
Hello Mia :) thank you for such a beautiful pattern. i need your help regarding the body,, Do we close the have to close the magic ring? Hi, Karishma! Yes, you have to close the magic ring. what wire did you use ?? I used galvanized soft wire. I’m making it as a gift for a friend but I would also want to post it on my FB page. It’s just a page where I upload crochet stuff. I’ll be sure to give your pattern proper credit. Do you think that’s fine? Haha, great! I love that idea! I’m going to try using a bulkier yarn too! May I share the photo of your charizard here? Sorry for the late reply. Yeah sure you can put a picture here. :D That would be awesome. Also, I have a different question for you. Do you have any experience with short hair on amigurumi dolls? The whipping method (like Charizard’s tail) doesn’t really work on dolls. Do you have any idea how that’s done? Also the arms and wings if you know. :) Thanks! Hi! Do you know which rounds of the body to sew the tail in between? Hi, I don’t know >.< Maybe, 8-18. Hello my name is Rubén and my english is not very well, i’ve made the head and the body and I’m doing the arms at the moment, but I’m having problems with them, when you say increase, if I have 10 sc I’ll have 11 sc, isn’t it? I’m a bit lost because I don’t know what I have to do when you say skip, what do I have to do when skiping? Yes, when you do an increase you increase the amount of stitches, so, if you have 10 and you make a increase, you will have 11. When I say “skip” it means that you will jump the first sc and go directly to the second one, in order words, you won’t crochet in the first sc, you just crochet in the second one. I’m a little confused D: i’m currently working on the body and i’m on round 3. i so a single sc and then continue the rest of the round with inc? because it comes out to an odd number if the rest is inc..
You have to crochet one sc and then make one inc. Repeat that sequence until you reach the total amount of stitches (24). 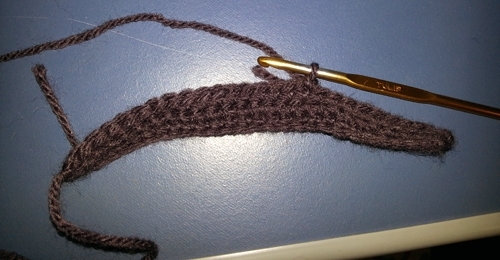 In this case you will first make a single crochet, then a single crochet in the next chain, after that decrease. First of thanks so much for this pattern! Second did you only use the 2.5 mm hook for the fingers and toes and the 4mm for everything else? Third I’m having trouble switching from rounds to rows. (I’m a noob) Am I correct in thinking for the first row you continue with your stitches as if you were crocheting a round and then after the last stitch you chain one (which is just pulling another loop of yarn through the already existing loop right?) 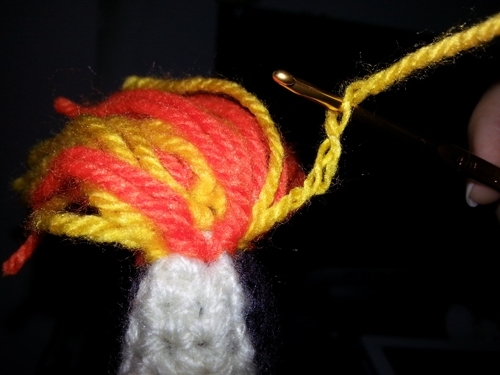 then turn the piece and continue to crochet (the same way that was done in the rounds), chain one turn etc.? Yes, I only used the 2.5mm hook for the fingers and toes. For the rest use the 4mm (G). hi, I’ve been working on this pattern for a few days now, and I’ve been kind of skipping around on the body parts, but I got tot the tail, and I’m not sure I’m doing something right because my rows aren’t adding up correctly. So I was wondering if it was me or if maybe there’s a typo somewhere in the instructions or something. Taking a fast look on his tail pattern, I don’t think there’s something wrong. Are you still having trouble with it? Have you had any trouble with the wire breaking after assembly?? I know if you hold wire in your hands especially the thin kind when you bend it back and forth it will break apart. 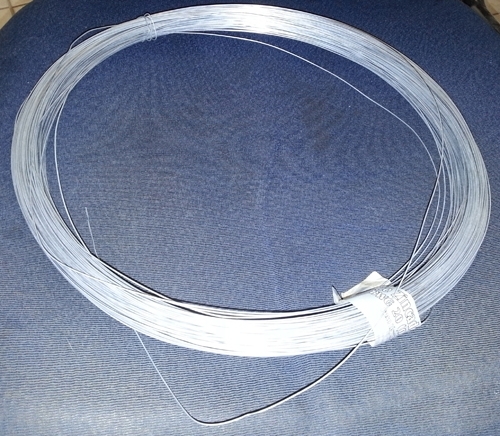 I have 18 gauge aluminum wire. Do you think that will be fine? I didn’t have any trouble with the wire xD I don’t think you will have any problem using a 18 gauge aluminium wire. 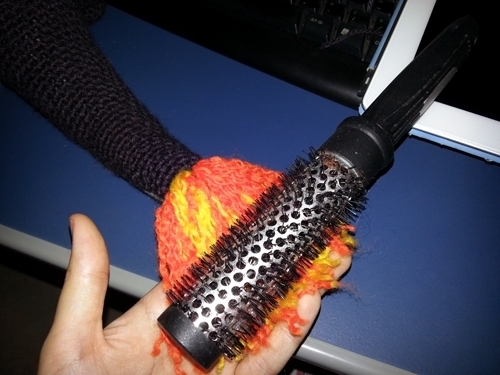 You should try to use it and see if you can crochet with it, if you think it is fine and the wire is hidden by the stitches, won’t be a problem. Yeah, maybe I mistyped it. Please, in which round are you having trouble? By the way, the first round was mistyped. I corrected it now. mi english is very bad! i don’t understand who make the head.. stars whit magic ring? or row? I love the pattern, you are a very talented artits, i must say tho that in stuck with the fingers and tows i just dont know how to do them… i´ve tried many times and i´m not sure how they have to go, please please answer me, i´d love to finish my charizard, thanks a lot!!! 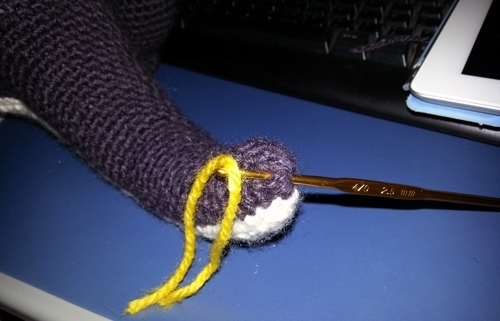 To make his fingers and toes you have to use a 2.5mm crochet hook and, also, you have to crochet very tight. The first Round of his fingers and the first three rounds of his toes you will crochet using a white yarn, then change to the main color and crochet the latest rounds. Thank you so much for the compliments!! ^__^ and I’m sorry for the very late reply, but I’m very busy atm. so, the only thing that changes is the hook size?? you dont use thinner yarn? Is he made out of wool or cotton? 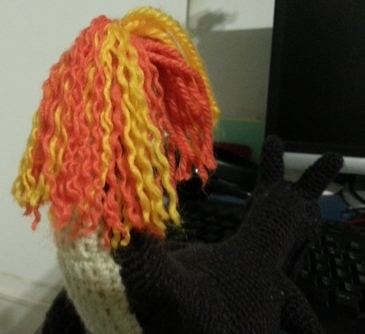 I made him with cheap acrilic yarn, which is similar to wool. I used a Galvanized soft wire. Omg he is the most wonderful thing here. I have to make him. Thanks so much. hi i’m translating your pater to dutch (because its easier for me to work that way but in row 14 of wings you said dtrc and i cant find a translate for this term so what is this??? Did you use 4mm yarn? If I use 5.5, and follow the pattern, will the appearance change or just the size? Anw, Madi, I don’t know the size of my yarn, I didn’t find it on the label :S Well, I think that only the size will change. I’m making this wonderful pattern right now, and I too got the problem with the lopsided head after row 9. I noticed it straight away though, so I’m just rearranging the stitches as I go. 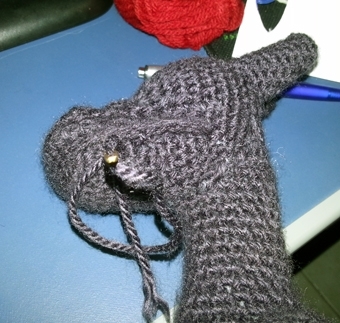 What I think though might be the problem, is it possible the head is supposed to be done in none-continuous rounds with slip stitches at the end of each row? I know the first round starts as this, but in the later rounds it’s not told to do so. I think it’s possible that my start of the round is too far into the circle because I was working continuous rounds. I really made his head using continuous rounds. I’m sure of that. I just do not remember if I really made this slip stitch at the end of the first row. At the moment I’m out of time to do the video tutorial teaching how to do his head, because I’m having tests at college. However, as soon as I get some time, I will upload it here. I was wondering if the feet of the Charizard needed stuffing. It doesn’t state in the instructions and I couldn’t tell from the photos if the bottom of the feet were stuffed. Yes it needs, but just a bit. Do not stuff it to much, because it will gets too round. Hi, I absolutely love this pattern! I’m almost done but I have the cream underbelly to do, I’m relatively new to crocheting and do not understand the (2 in?rst sc) bit? What does this mean? Thank you! It should look like a bottle. You are very welcome :) If you want, send me an email with a photo of your Charizard body. I’m sorry, I didn’t get in which part you are. Please, may you explain it better? Not to sound stupid, but when the body part says, “Now, we are going to work in rows.” that means i should chain one and turn after each row, right? “Tail : Round 3: (2 Sc, 2sc in next sc) repeat 2 times, then, sc and 2 sc in next sc (11) or Round 3: ( Sc 2, 2sc in next sc) repeat 2 times, then, sc and 2 sc in next sc (11) ” ? Let me try to explain. 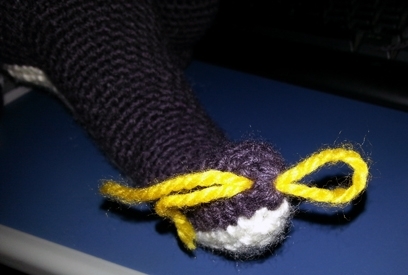 In Round 3 of his tail you will first crochet one sc and then another sc, after that, increase once. Repeat this sequence one more time. After that, crochet a sc, then increase in the next sc. How much yarn do you need for this project? I don’t know for sure. I bought three hanks of lead yarn (main color). About the other colors, just one hank of yarn for each is enough. I don’t understand the ch 6 moving on to sc 4. By now, I will try to explain it in words xD Well, this first round it is the beggining of an oval shape. Please, watch this video to have some idea of how it works: http://www.youtube.com/watch?v=_B9BinO3ULg. Now, that you’ve watched the video, I will try to explain the pattern xD First, you will chain 6 and then from the second chain from your hook you will crochet 4 sc. Now, you will crochet 2 sc in the same and last chain. Now, you will work in the other side of the chain, the bottom, as is shown in the video. Go to the next 4 chains and crochet one sc in each one. In the last chain crochet 2 sc. Now, slip stich in next sc. I don’t know if it is clear for you now. I’m really sorry, it is hard to explain with words :( I really need to make a video and I will. I don’t know if that is the answer you are looking for, lol, but, the secret to his poseable arms is wire. In the Assembly of the Pattern (Steps 1, 2 and 3) there are some photos of how you should use wire to make his arms poseable. I am working on the head, but when it comes to round 9, it gets weird. Their is distinction in the snout and the head are visible (the “dent” around) but when I do it, half is dented and half is sloped. I don’t know what I’m doing wrong ._. I’m trying to get some time to do a video this week to better explain that, but it is a bit complicated, because I’m studying for my tests at college. I will try to upload it as soon as I can. Do you ever make these as commissions? Thank you for the free pattern! I love it!